You know, they should have digitally slimmed him a bit. 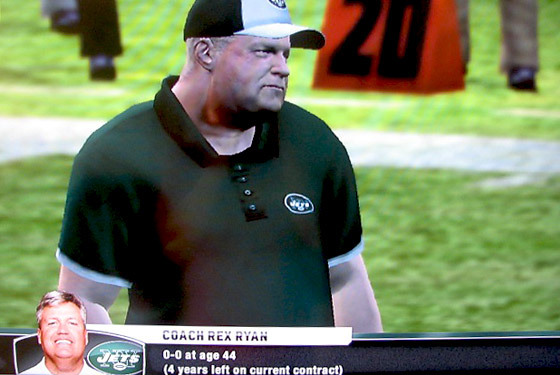 Last week, our PlayStation 3, a gaming platform we use exclusively to simulate real-world sporting events, told us that Mark Sanchez and the Jets would be defeated by the Bengals 30–22, thanks largely to four Sanchez interceptions. We ran this coming Sunday's Jets-Chargers game through the ol' video-game flux capacitor, and boy, was it ugly. You thought four interceptions was bad? In this one, Sanchez threw six, including two that were returned for touchdowns (both in the fourth quarter), and San Diego throttled Gang Green 53–7. Sanchez was so awful in this game — 9-for-31 passing, 66 yards, 0 TDs, 6 INTs — that we had to check the game's settings, to make sure we didn't have it on some sort of crazy cornerback mode. We didn't. LaDainian Tomlinson ran for 112 yards and a touchdown, and the only Jets score came on a kickoff return from Brad Smith. The game was relatively close until the fourth quarter, when the Chargers scored 27 unanswered points, thanks in part to those two Sanchez pick-sixes. If this is how it goes down Sunday afternoon, we are sorry. Get more: playoffs!, a grown man watching a video game play itself, football, jets, sports, rex ryan, san diego chargers, mark sanchez Photo: Will Leitch, off his television.